Crassostrea virginica, the eastern oyster. 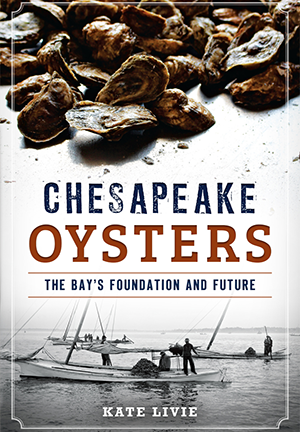 These humble bivalves are the living bones of the Chesapeake and the ecological and historical lifeblood of the region. When colonists first sailed these impossibly abundant shores, they described massive shoals of foot-long oysters. But the bottomless appetite of the Gilded Age and great fleets of skipjacks took their toll. Disease, environmental pressures and overconsumption decimated the population by the end of the twentieth century. While Virginia turned to bottom-leasing, passionate debate continues in Maryland among scientists and oystermen whether aquaculture or wild harvesting is the better way forward. Today, boutique oyster farming in the Bay is sustainably meeting the culinary demand of a new generation of connoisseurs. With careful research and interviews with experts, author Kate Livie presents this dynamic story and a glimpse of what the future may hold. Kate Livie is a professional Chesapeake educator, writer and historian. An Eastern Shore native, Livie is passionate about the Chesapeake Bay's culture, heritage and landscape. She currently serves as the director of education at the Chesapeake Bay Maritime Museum in St. Michaels, Maryland, and writes for the Chesapeake Bay Journal and beautifulswimmers.tumblr.com. She lives with her husband in Chestertown, Maryland, and to date she owns thirteen oyster knives.